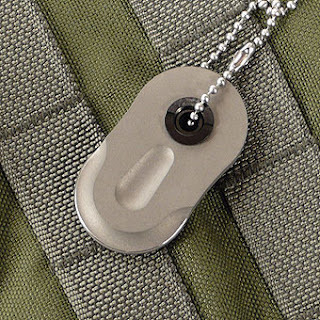 This is a new version of TAD Gear's Titanium Dog Tags. The Tags can be used as both an identification device and as en emergency cutting tool. The tags have two titanium parts that pivot around a black anodized titanium pivot, one of the edges is sharpened to be used as a cutting tool you just pivot and click to open or close the tags. There's also one side available to be engraved and be used as a regular tag with the information you want, depending on what you do or what you want to put in the tag. The construction and quality of this new version is very high, all the parts are very well built and the titanium pivot is a particular good detail, it can be adjusted to the tension you want depending on how easily you want to be able to rotate the tags to open and close, if you wear them around your neck then you should adjust them tight and have the blade as an emergency one. If you hand the tags somewhere else you can leave the pivot not so tight and have a quick mini blade handy when needed. Being made of titanium the tags are very light and will resist corrosion and wear, the engraved part can get scratched from play against other neck chain since titanium is strong but gets scratched more than steel or even aluminium. You can read more and order from TAD Gear for $59.